Russ DiGilio, Founder and Owner of Duck Donuts Franchising Company LLC, has been named the 2016 Entrepreneur of the Year by the Harrisburg Regional Chamber & CREDC (Capital Region Economic Development Corporation). Russ DiGilio, Founder and Owner of Duck Donuts Franchising Company LLC, has been named the 2016 Entrepreneur of the Year by the Harrisburg Regional Chamber & CREDC. I would not be where I am today, nor would Duck Donuts be experiencing such growth, without the love and support of my family, the hard work and devotion of my Duck Donuts team, and the best donut fans in the world. Each year, chamber member businesses and individuals are honored at the Catalyst Awards for their outstanding contributions to the Harrisburg Regional Chamber & CREDC and the community. In addition to Entrepreneur of the Year, categories include the Athena Award, Business Diversity Champion, Catalyst Award, Government Leader of the Year, Lifetime Achievement Award, Small Business of the Year, and Volunteer of the Year. Recipients will be recognized at the annual awards event on Wednesday, November 30, at the Whitaker Center for Science and the Arts, Harrisburg, Pennsylvania, at 5:30 p.m.
“An entrepreneur, by definition, is a person who organizes and manages an enterprise with considerable initiative and risk. Russ DiGilio took an idea and added the initiative to open a freshly made donut shop at his favorite beach. 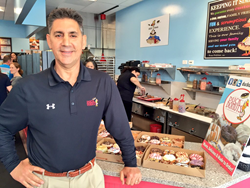 He then created a franchise model and partnered with other entrepreneurs who understood his vision and business model to grow into an award-winning donut enterprise. From the original shop in Duck on North Carolina’s Outer Banks, to his new store and training facility on the Carlisle Pike in Hampden Township, Russ joins a notable list of successful, local entrepreneurs. Duck Donuts is proof that central Pennsylvania’s entrepreneurial spirit is a powerful engine for building businesses and creating jobs,” says David Black, president and CEO of the Harrisburg Regional Chamber & CREDC. In 2013, the first franchise location was opened in Williamsburg, Virginia. “We were approached so many times to consider franchising that we finally had to embrace the idea,” says DiGilio. Loyal followers begged for a Duck Donuts in their communities and now, as of October 2016, there are 28 open stores and 110 locations signed to contract in 13 states. DiGilio and his wife, Christy, have five children, all of whom are integral to the family business. After raising his family in Mechanicsburg, DiGilio decided to locate the company headquarters in his hometown in 2016. Before diving into the hospitality industry, DiGilio was Founder/President of The Autumn Group, a management company for long-term care facilities where he owned and operated senior and assisted living facilities. He has over 30 years of health care experience. DiGilio holds a BA in Psychology from West Chester University. A member of the Harrisburg Regional Chamber, the West Shore Chamber, and the Mechanicsburg Chamber, Russ is passionate about giving back to the community. Franchise-wide, Duck Donuts has a program titled “Quack Gives Back” and each month Duck Donuts make a difference in every community they serve. By 2011, Duck Donuts had expanded to four Outer Banks locations and the donut business was so successful that DiGilio was continuously approached about franchise opportunities and by fans who begged for a Duck Donuts in their communities. The first franchise opened in Williamsburg, VA, in 2013 and there are now 28 open franchise locations.